La pétanque turns 100 ! Pétanque was invented by Jules Lenoir in La Ciotat, a village near Marseilles. Lenoir loved to play boules, the French version of bowls, where you take a run-up and throw the ball down a long pitch. However, rheumatism was making it difficult for Lenoir to run, so he got his friends’ agreement that he could sit on a chair and throw from there. In fact, rather than leave him at a disadvantage, Lenoir’s friends decided that they would all abandon their run-up, and instead throw with their feet together from within the same small circle on the ground within which Lenoir placed his chair. 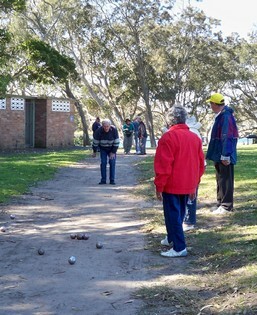 This a very popular french bowls game and it would be great to start our pétanque rendez-vous! Time and place of our next Pétanque meeting is to be advised. 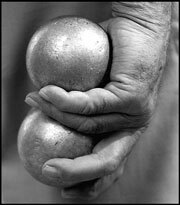 Pétanque got its name from the Provençal words ped tanco (pieds tanqués in formal French), meaning feet stuck to the ground. These days, some 17 million French people are said to play pétanque, and there are also formal associations in Anglophone countries such as England, Australia and New Zealand. Metal boules are used. 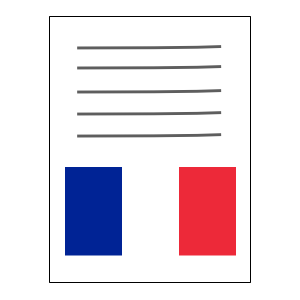 These are required to meet official specifications and are mostly manufactured in the town of St-Bonnet-le-Château (a little to the west of the gorges on the upper reaches of the Loire). The current rules of the game were last approved by the International Congress of the Fédération Internationale de Pétanque et Jeu Provençal held in Grenoble on 3rd October, 2002 . 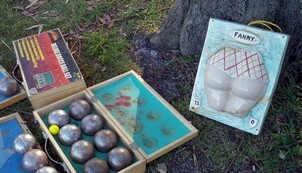 The club has a number of Pétanque sets available. Currently there are no regular players. If anyone is interested in organizing a regular game, please contact the President.